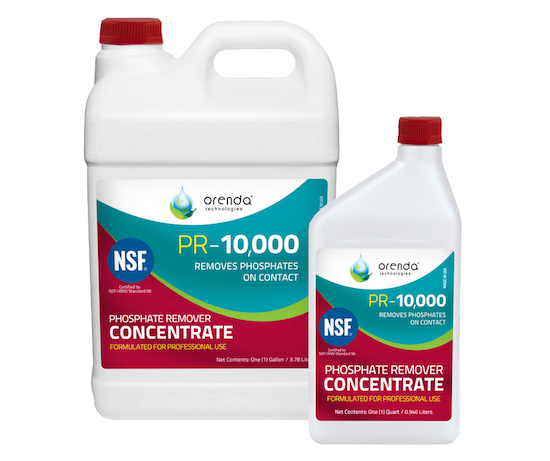 When first using Orenda products like SC-1000 and CV-600/700, the initial dose is what we call the purge dose. So what is a purge? And why is it necessary? This article will explain. What is a purge dose? A purge dose of Orenda chemicals is the initial dose to overpower the targeted oxidant demand and also leave a residual for the future. 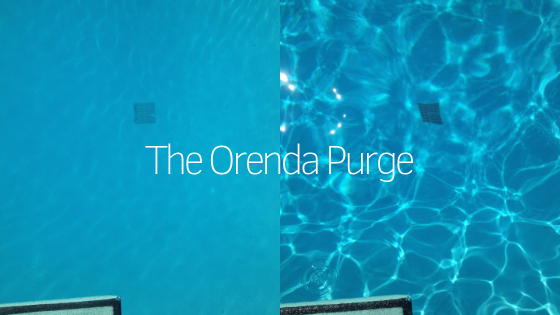 An Orenda purge is usually one quart per ten thousand gallons (32 fl.oz./10,000 gallons). Let's use CV-600 enzymes as an example. The CV-600 purge puts enough enzymes in circulation to not only clean the water, but also leave behind a residual. You need a residual for CV-600 to keep up with the bather demand. How long does the purge last? The purge dose of enzymes should last for a few weeks, and SC-1000 Scale & Metal Control can last even longer. That said, these products get used up doing their job, so the water needs a maintenance dose of a few ounces per week, depending on bather load. For pools serviced weekly, once a week is fine. For commercial pools, we strongly suggest dividing the weekly maintenance dose over several days a week. Most commercial customers use a feed pump of some kind, and most residential customers just use a measuring cup. So the process is simple: purge to start, and add the weekly maintenance dose from then on to replenish. Orenda chemicals address specific problems, not every problem. SC-1000 chelates metals (including calcium, which is an alkali earth metal) to prevent stains, metal oxidation and carbonate scale. CV-600 and CV-700 enzymes break down and remove non-living organics, like bather waste. This waste spreads around in the water, but usually floats up near the surface (because oils are lighter than water), and we need enough in the first dose to overcome the the demand AND create a residual. Think about it. Metals are in solution or suspension, and bather waste is constantly being introduced into the water. Point-of-contact systems like UV, filters, and even strainer baskets are only effective when water passes through them. But non-living organics are out in the pool where people are...and that's where Orenda products need to be too, right alongside residual chlorine. The purge dose can overpower and still leave behind a residual for the future. There are only some rare exceptions to this, like if metals in the tap water are absurdly high, or some other anomaly like that. Without a purge dose, the existing demand may not be completely addressed, and you may not get ahead of the problem. For example, if you only chelate 70% of the metals in your water...that still leaves behind 30% of the metals in your water that will be oxidized by chlorine, and that 30% could be plenty to leave stains or change the color of your water. It's not that SC-1000 failed, it's that there was not enough of it to cover the demand. The same can happen with enzymes when customers just start with the weekly maintenance dose and do not purge at the start. After the purge, the weekly maintenance dose replenishes what has been used up. Enzymes eventually get used up removing carbon-based waste (non-living organics), just like SC-1000 gets used up chelating metals (including calcium). Because your tap water and bather load introduce new metals and organics, the weekly maintenance dose is important. Fortunately, Orenda maintenance doses are usually small and affordable. It all depends on your pool and it's needs. If your pool has special needs, just contact us and we can help create a custom dosing program for you. Here is a table showing purge and maintenance doses for two Orenda products. You might notice our phosphate remover, PR-10,000 is not on this chart. That's because PR-10,000 is not a product that creates a residual. Phosphate removal is a one-and-done reaction, designed to work quickly and fall out of solution. We recommend it to be used on an as-needed basis, and unless your pool is in really bad shape or has very high phosphates (several thousand parts-per-billion), we suggest 8 fl.oz. per 10,000 gallons at a time. Green Pool from Algae: No Orenda product will kill the algae, so you will need to shock with unstabilized chlorine, and lower the pH. Drop the pH to about 7.2 -7.4, and shock with liquid chlorine (sodium hypochlorite) or cal hypo (calcium hypochlorite) as you see fit. Algaecide is not necessary, because chlorine is the best algaecide. We immediately follow the chlorine shock with one quart per 10,000 gallons (32 fl.oz./10,000 gallons) of PR-10,000 phosphate remover. The next day the water should be clear, but debris everywhere. 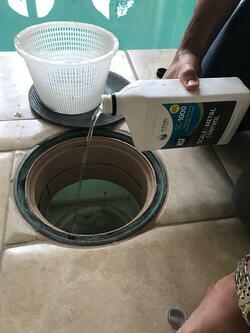 physically clean up the pool, vacuum to waste, and clean the filter. Then purge with 32 fl.oz./10,000 gallons of CV-600 enzymes. 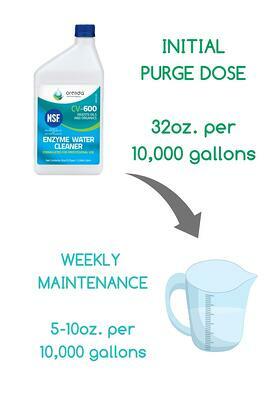 Cloudy, dirty water: Purge with CV-600 enzymes and 8 fl.oz./10,000 gallons of PR-10,000. If you want, you can follow it up with 1 fl.oz. of CE-Clarifier for larger particles that may be floating around. Carbonate scale: Purge with SC-1000 and raise the water level enough to soak the affected tile line as much as possible. Keep water circulating, and since SC-1000 can deplete chlorine levels for a day or so, manually feed chlorine as needed. Continue on maintenance of 3 fl.oz./10,000 gallons per week until the scale has softened enough to be removed.